Commonly called Cat Thyme, Teucrium marum is a shrubby perennial that is an ideal addition to the drier border areas of the garden. It is called Cat Thyme because it acts as a stimulant, however it is not a thyme plant at all. The problem with cats and Cat Thyme, is that they will destroy it fairly quickly. They rub against it roll on it and generally get very excited about this new plant. 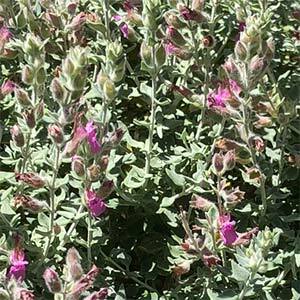 The plant is also used in a range homeopathic remedies and is only one of a number of Teucrium species which are collectively known as Germanders.. In the garden, it is groan for the foliage and the attractive flowers as well as its easy care, drought tolerant nature. A well drained humus rich soil and a sunny position is about all that this plant requires. Wherever you plant it, cats will roll in it and make it a little messy, so if this is an issue, plant it somewhere out of sight. You can mulch around it to give the plant a cooler root run, and you can use a little general purpose fertiliser in spring to improve growth. Other than that, pruning to maintain a tidy growth habit is all that is required. Prune back after flowering to keep growth habit tidy and encourage new fresh leaves. By division, from semi ripe cuttings and from seed. Foliage – Mid grey / green. Height – To .3 metre (12 inches), taller in good conditions. Spread – Clump forming to .3 metre. Pruning – Prune back after flowering by 1/3rd.